Members of the Anabaptist Christian Bruderhof Communities live, eat, work and worship communally. An intentional community is a planned residential community designed from the start to have a high degree of social cohesion and teamwork. The members of an intentional community typically hold a common social, political, religious, or spiritual vision and often follow an alternative lifestyle. They typically share responsibilities and resources. Intentional communities include collective households, cohousing communities, coliving, ecovillages, monasteries, communes, survivalist retreats, kibbutzim, ashrams, and housing cooperatives. New members of an intentional community are generally selected by the community's existing membership, rather than by real-estate agents or land owners (if the land is not owned collectively by the community). Many communities have different types or levels of membership. Typically, intentional communities have a selection process which starts with someone interested in the community coming for a visit. Often prospective community members are interviewed by a selection committee of the community or in some cases by everyone in the community. Many communities have a "provisional membership" period. After a visitor has been accepted, a new member is "provisional" until they have stayed for some period (often six months or a year) and then the community re-evaluates their membership. Generally, after the provisional member has been accepted, they become a full member. In many communities, the voting privileges or community benefits for provisional members are less than those for full members. A survey in the 1995 edition of the "Communities Directory", published by Fellowship for Intentional Community (FIC), reported that 54 percent of the communities choosing to list themselves were rural, 28 percent were urban, 10 percent had both rural and urban sites, and 8 percent did not specify. ^ "Experience colourful Christiania". Visitcopenhagen (in Lingala). Retrieved 2017-10-27. 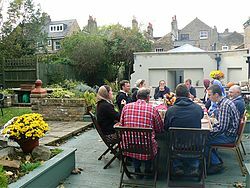 ^ "Learning from the Bruderhof: An Intentional Christian Community". ChristLife. Retrieved 2017-10-27. ^ a b Fellowship for Intentional Community. 2005. Communities Directory. 4th Edition. Rutledge, Missouri, USA. ISBN 0-9718264-2-0. Curl, John (2007) Memories of Drop City, the First Hippie Commune of the 1960s and the Summer of Love: a memoir. iUniverse. ISBN 0-595-42343-4. Lupton, Robert C. (1997) Return Flight: Community Development Through Reneighboring our Cities, Atlanta, Georgia:FCS Urban Ministries. Moore, Charles E. Called to Community: The Life Jesus Wants for His People. Plough Publishing House, 2016. “Intentional Community.” Plough, Plough Publishing, www.plough.com/en/topics/community/intentional-community.